Initially, I reviewed these pianos (PX130/330) in late Nov 2009/early 2010 when they first came out. As of this writing, Casio still has the lead (in my opinion) over it's competitors in portable full size digital pianos under $1000. The Casio Privia PX130 and PX330 digital pianos are very nice instruments. They are the slimline lightweight (about 26 lbs each) models that have many things a person could want in a small, low profile cabinet and these pianos break the price barrier (in my opinion) for features & sound dynamics from very soft to very loud. As a professional pianist, music educator, and digital piano consultant, I believe the newer 2013 Privia PX150/PX350 portable pianos for under $1000 are the best in their class. In fact, these digital pianos are difficult for many people to tell apart from some traditional upright acoustic pianos for feel and tone although the speakers and power output in them is minimal, but so are most of these less expensive portables with built-in speakers. The pianos sound pretty good for their size, but to achieve a louder, fuller sound, you would need to plug them in to a bigger home stereo system or powered speakers, or...you could use a good pair of headphones. Although there are definitely other brands of good quality digital pianos made such as Yamaha, Roland, and Kawai, you would have to spend more money and still not get many of the advanced features the Privia's have, especially the PX350. Now that the PX130 & 330 are discontinued, the improvements in the new PX150/350 models are substantial so I would definitely recommend you take a look at those instruments rather than buy the older series even if they be new or used for less money. Whether you are a beginner, intermediate, or advanced player, these new model pianos (Casio PX150/350) might be just what your looking for if you need something really good but relatively inexpensive, compact, lightweight, and easy to move around. Please contact me to get more information and to find out about buying a digital piano for LESS MONEY than internet price. Email me at tim@azpianowholesale.com or call me at 602-571-1864. The px-330 does not have the 60-song music library that the px-130 has. Can this be requested to be included in the px-330? Thanks. I am learning lot from your experiences and blogs. The PX130 songs are not transferable to the PX330. The songs in the PX130 play back as MIDI file songs. The PX330 has the SD card slot for a 2 gig SD card which can play unlimited MIDI song files. These MIDI songs can be downloaded from the Internet to a SD card so you can play hundreds and thousands of them...many more than the PX130! Also the PX330 song files can play back in the general midi format for full 16 part arrangements. Sounds like a great instrument at a great price-point! I wonder, is MIDI song transfer/playback possible just through the SD card (and surely not really limited to "just" a 2GB SD card, but can go 4GB, 8GB, etc? ), or can this be accomplished via a thumbdrive into the USB port? Thanks - much appreciate your experience, blog, and great reviews! Thank you for your comments. A thumbdrive is also another device that will store MIDI files for those instruments that take flash/thumb drives. MIDI files take up a very small amount of memory for storage so the Casio pianos only need a 2 gig card, which is the maximum that it (the PX330) will read. A 2 gig card can hold 100's of MIDI files with no problem although you can certainly put MIDI files on higher memory storage devices. Also, the SD card on the Casio is divided up into 4 distinct folders for easier access and storage as opposed to some models with only one folder for all files. There are good reasons as I talked about already for getting the PX330 over the PX130. But some of these additional features need a more detailed explanation which I will do if you contact me by email. Also, I can give more details about lower prices incl special additions that are very useful for music education. I am looking to buy either the PX130 or PX330 and have no idea which one... What exactly are the differences? Is it just the range of extra sounds and songs? I just play piano for my enjoyment and most likely wont use lot of extra sounds etc. Would it be wiser to save some money and get the 130? Thanks! I talked about many of the differences in this blog. If it is mainly for piano playing only, then the PX130 would be the way to go. Got the PX-130. Sounds great! Looking forward to trying it out with a computer to use as an AID to actually learning the piano. The keys feel great, though a little 'hard' to press down. Of course, that's probably because I'm not used to them. I hope that I learn 'properly' because I'm practicing on a weighted-key digital piano. Thank you for your in depth reviews. Very useful. If I just want a digital piano that sounds like and play like a real piano, don't care about other functions like midi or recorder, with budget around $1000, which one would you reccommand? Hi Tim, congrats on the excellent blog! I´m from Brazil and I´m trying to decide between the Casio PX330 and Celviano AP420 which have exactly the same price tag here, around $1800. I have started my piano lessons 6 months ago. The AP620 is sweet but out of my budget as here it costs $1000 more than the AP420! What do you think? Thanks. Thank you for your comments from Brazil. I like both pianos and they are obviously very different from each other. The AP420 is very basic in functions but better for cabinet (which includes bench) and audio volume (much more powerful). The PX330 has substantially more technology in every way and can play General MIDI song files on SD card (AP420 cannot play this GM format) which helps the learning process and also fun. Both pianos can connect to computers using USB output. The PX330 would require additional accessories such as stand, bench, pedals, etc., and it sounds better through additional speakers or stereo headphones. It just depends on your musical goals and needs. Hi Tim, I find your reviews very informative. My limited knowledge of file formats is, however, delaying my decision on which piano to invest in. My basic requirement is that, when I use a USB or SD card connection to transfer a new composition from the piano to my computer, I want to be able to play it back on my computer exactly as it sounded on the piano. I don't believe this is possible with MIDI. Am I incorrect? For example, the well-reviewed Casio PX330 only stores in MIDI formats, but the Yamaha CLP 430 stores in WAV or MP3. That is more of what I am looking for. I would be happy to give you more info about your questions if you would like to email or call me directly (calling assuming you live in the US). You mention the PX-330 has a "jam session" feature. I have a PX-330 and have not found it. How does one enable it? concerned about the compatibility and accuracy with ipad? Hi Tim - I'm wondering which piano you would recommend for classical piano pieces? The 130 or 330? I don't anticipate needing a lot of features outside of just the most "real" feeling piano. Thank you so much! The PX130 and PX330 have identical key actions and internal sound amplifiers so I would recommend the PX130 based on your question. Love your reviews, very informative. Just upgraded from the CDP-100 to the PX330, the improvement was well worth the cost, the superior piano sounds alone, not to mention the additional functionality make this a most excellent purchase. Many thanks for good review and blog. Hi Tim! I have been playing piano for 25 years on a 125 year old piano. I am going to be needing a stage piano soon as I have stepped out of my comfort level and going to be doing some shows and have been performing with a church praise band. So, I went to my local music school that my family has been using for 50+ years and tried all their digital pianos. I picked the Korg SP-250. I did this mainly because of the feel of the keys and action. A few months passed and I decided that is the one I needed. I got the piano without second guessing and trying others again. I got it home yesterday and was playing it and am really dissatisfied with the sound of the upper octaves. They just do not sound real to me. I talked to the Music store I purchased this from & they are offering an exchange. They have a Roland 7? and a Casio Previa PX330? I am not sure of the last one exactly. But seeing your blog, it states the PX 330 have been discontinued and they are offering something better. In your opinion, what would you recommend? Of course the Roland is much more expensive but the Casio is the same price at this store. Time if of the essence as I have to tell them something tomorrow. I do hope you get this in time to respond. I really do appreciate all the time and effort you spend doing a blog and helping others. It really is wonderful!! Thanks you in advance!! Hi I am choosing between PX 330 and CDP 230. they have the same price here in our country. I am a beginner. which piano would you recommend? WANT TO SPEND LESS MONEY ON A DIGITAL PIANO WITH EVEN LOWER PRICES? CALL US! I write the Best, most detailed Digital Piano Reviews in the World and can offer LOWER PRICES too! Learn more about the Top Digital Pianos! Please click here to read Dylan's story. YOU CAN DONATE TO DYLAN THROUGH PAYPAL IF YOU WOULD LIKE TO HELP HIM! The top 10 digital pianos offering the best "biggest bang for the buck" in 2019. Click on picture for more info! - 6 Digital Piano Shopping Secrets Revealed! - Digital Piano vs Acoustic Piano - Which is better for YOU! PRIVATE FACTORY SALE at 40% OFF! (1 only 1st come 1st served) on a new 30" deep Samick SG120 Digital Micro Grand Piano in POLISHED RED!. No sales tax, free shipping, full factory warranty, bench, with $500 "player" music library. Click on the picture for my review. Click on the picture and read these IMPORTANT SHOPPING TIPS before you buy any Digital Piano from Anybody! Content Disclaimer: All my reviews are independent of any others on the internet and are done with great research, time, energy, and personal experience on my part with each instrument. The content and reviews that I publish for the public are my personal opinions based on my experience for many years as a professional musician, piano instructor, and piano consultant. I am am not a Yamaha or Roland authorized dealer although I do recommend many models from the top brands including Yamaha & Roland and can help you find an authorized discount retailer should you decide to purchase one. 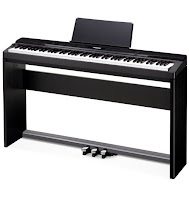 We can order many pianos direct from many top name brands including Kawai, Casio, Samick, Dexibell, Korg, Kurzweil, Galileo, Pianoforce, and others for less money than many retail and online stores including Amazon and ebay. I am in no way affiliated with or part of AZ Piano Company, a retail piano store in Phoenix, AZ. I am not paid for my reviews from any manufacturers, distributors or re-sellers. All my reviews are done by myself and are for public use. My desire and goal is to refer you to any brand & model of new piano, digital or acoustic, that meets your musical goals, budget, and overall needs. AZ Piano Reviews, a division of Arizona Piano Wholesale LLC, is committed to continually blogging about pianos and related content. This blog is to give info to the public so they can better determine which piano product, service, or information may be right for that individual. Arizona Piano Wholesale LLC can and does order new pianos direct from selected suppliers & manufacturers, and can help you get lower prices from independent retail stores, brokers, distributors, and manufacturer suppliers. 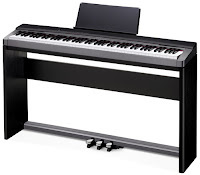 As I mentioned earlier, although we are not an authorized Roland or Yamaha piano dealer, we do recommend many brands and models of new digital pianos, including Roland & Yamaha, and will direct you to an authorized source in the US for even lower prices than internet, Amazon, or store prices on all major brands of digital pianos. AZ Piano Review & News Blog by Tim Praskins. Copyright 2009-2019. Powered by Blogger.